"He had the calm confidence of a Christian with four aces." Getting to the final table of a tournament that began with a decent amount of entries is always an accomplishment. Most people need to run significantly luckier than average to accomplish it -- especially in No Limit Hold'em where winning numerous coin flips for all your chips is a necessity. On the other hand, highly skilled players don't need to get lucky to make a final table, but they do need to avoid running significantly unlucky. So a typical final table may have one or more highly skilled players who got there despite running below average in luck during the tournament, but most of the final table players, including most highly skilled ones, will have been among the luckiest (say at least the luckiest 20%) to that point in the event. The logical and strategic implications of this "table full of luckboxes" reality deserves far more attention than it gets. For a highly skilled player, playing at a table full of people who have been running good is normally heavenly. Whim players, non-mathematical players, players without a strategic overview to their tournament play adopted before the cards have been dealt... when these types of players run good, they think they can dodge bullets. They think the law of averages and laws of physics are meant for mere mortals, not them. In short... they think they will "get there" in whatever hands they play. If they have been making flushes, they think they make this flush draw. If their bluffs have been working (because they are soooo clever in picking their spots), they will think this next bluff will work. Watching the replay of a Stud High-Low tournament the other day, on fifth street a player with four to a low and four to a flush capped the betting against an opponent with an open pair of Aces. The low/flush-draw player was the chipleader, and was being assaulted by the deck over and over... making scooping hands, escaping with half when his opponent had a monster to win the other half, etc. Putting in the last raise with this low/flush-draw hand on fifth street against a player who might already have a full house was nonsensical, but through the computer screen you could just feel that this player knew he was going to get there. Simulating the two hands shows the Aces would scoop about 20% more than the low/flush-draw player, but the equity was only about 10% different. Still, it's not the bad play that is the point here. The point is the player was playing bad because he had been running so good. This factor should get a lot more attention in poker reporting than it does. Often times a hand will get reported that doesn't seem to make sense, but suddenly does make sense if you understand one (or both) of the players have been running as if the hand of God is holding their cards. This "running like god" (or "running like god-mode") explains a great deal of the blowups we see at final tables (or very deep in tournaments). Poker is about adapting, but it's a poor plan to adopt a line of play based on the assumption you will get lucky. Many final tables feature a player crashing and burning in about sixth place who has been the chipleader for hours or days. These players will lose, and lose rather quickly, because the horseshoe finally falls out. Playing against opponents who have been running good all day/week is to be playing against false confidence due to always "getting there" or having the deck bail them out. They should generally be your #1 target at a final table. Simultaneously, an opposite phenomenon often plays out at final tables. Sometimes very tight players will make the final table who play great starting hands well and make few mistakes. But these players have their own Achilles heel at a final table as play gets shorter. A great example of this was an Omaha High-Low final table, down to three players. By far the tightest player that started the final table was in the small blind, and by far the loosest was in the big blind. The tight player limped with 8643. The loose player checked the big blind with KJ63. The flop comes 764. The tight player flops two pair with an 83 low and... checks. The loose player flops middle pair with a King kicker, and a one card low draw and bets. The tight player folds. 2) the tight player had been playing good starting cards all day, cards that he knew how to play well post-flop. But now when he played unfamiliar garbage cards, he didn't know what to do with them! He didn't adapt, in part because he had not needed to adapt earlier in the tournament. If instead of folding, the tight player would have checkraised the loose player, he would have won the three bets in the pot, or at least have been near-freerolling the loose player. If you are a very tight player, and 99.99% of your poker playing involves not playing weak, random cards, then why when short-handed at the end of tournaments where big prize money is at stake do you suddenly start playing bad cards (for a limp bet that allows your opponent to play for free)? Don't put yourself in unfamiliar, uncomfortable territory when you don't have to. While both the majority of loose players and the majority of very tight players will make final tables because of luck, and while both those types will have made many very good hands relative to the amount of hands they've played, as play gets shorter, the advantage goes to the loose/lucky players over the tight/lucky players. Bad players in the habit of playing bad cards have an edge at the end of tournaments over tight players incapable of adapting to having to play mediocre cards. Besides making hands, too loose players in god-mode will win lots of pots by betting and getting opponents to fold. Too-tight players need the rarer combo of 1) getting more than their fair share of good starting cards, and then also 2) having those good hands win. "Tight is right" is the correct attitude for getting the money in all forms of poker, but "tight" 9-handed is different than tight 6-handed, which is different than tight playing head-up. "Tight" is relative to your circumstances. Great poker players make the mathematically correct decision, for the right reasons, at the right time. They hold tightly to that, even if sometimes they get unlucky. Start with a better EV+ circumstance than your opponent, win the pots where you end up with a better hand than your opponent, and win some pots when your opponent has a better hand than you. Luck is not a central element in any of that. Playing head-up in a freeze-out tournament with limited chips is a relatively rare situation for anyone, but again a core principle should be that if you aren't comfortable or familiar playing in some situations, don't solicit these situations unless you absolutely have to. 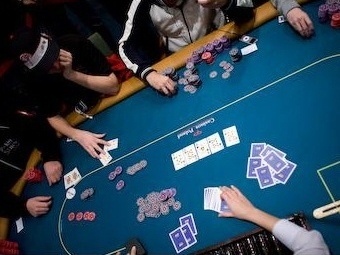 Most players who have gotten to the final table via running lucky tend to play head-up poorly. Assuming both players have a decent amount of chips, freeze-out head-up poker should be quite time-consuming. But very often head-up confrontations don't last very long at all, especially in No Limit Hold'em... and a big reason for this is often that "I'm a luckbox running in god-mode" factor. Players who have played a lot of No Limit events but still have very little head-up experience seem to often immerse themselves in their own "dodge bullets" Kool-Aid. The person in position has a great advantage over the player out of position. So, why on Earth do so many players insist on calling from their big blind with hands as weak as 92offsuit? Do they somehow forget that the very next hand they will be dealt in on the button and they can raise from position with 92offsuit instead? It's not being rude to fold 92 in the big blind. Even worse, when in position players will often adopt a "standard" raise size. But hands aren't "standard". Some are way better than others. Some are more likely to bust an opponent when they hit big. Others are more likely to win a middling-sized pot when they hit big. Some, like 92offsuit, are best for just stealing the blinds. In short, the skills required to do well playing head-up poker are not the same skills involved in building a chip stack when running good earlier in tournaments! This means that oftentimes the two remaining players are both ill-suited to playing head-up poker at this particular moment in their poker lives (after running in god-mode for hours or days). So, as a tournament player, you should be battling hard to turn off all the impulses and reactions to having run good in this tournament, and instead shift to the mindset of exploiting your position and patience over a person who still thinks he can walk on water. And, as a tournament reporter, or an observer trying to improve your game, you should challenge yourself to recognize the difference between those players who are playing sound head-up poker versus those players whose actions are more in line with god-mode thinking. Of course, luck will always be there. A deuce can come on the river and make all the difference. But since first place typically pays significantly more than second place, there may be no moment in poker where more value is transferred between players than when tournaments shift to head-up, and more skillful/sensible/adapting players grab value from god-mode players who don't adapt.